Peeling Boiled Eggs Like A BOSS! RancherMan & I have several free-range hens and they provide us with an ample supply of fresh healthy eggs. I like to boil up a whole pot of them at a time and keep ’em in the fridge for a high-protein snack for him to grab-n-eat when he’s hungry. But he really likes the convenience of having them already peeled when he reaches for them. Hey, I’m a happy girl that he’s eating something provided right here from our homestead instead of reaching for sugary or salty snacks, so I’m very willing to make it as convenient as possible for him. Luckily there’s an easy way for me to keep peeled hard boiled eggs in the fridge at all times. I first boil the eggs for about 12 minutes. Then I strain out the water and allow the cooked eggs to cool completely in a colander, oftentimes storing the colander in the fridge overnight. But when I’m ready to peel a bunch of eggs for my handsome RancherMan I can pull out the cooled eggs and drop one into an empty glass jar. I add water to just below the height of the egg in the jar, then place my hand over the mouth of the jar and shake as vigorously as I can for about 5 seconds. The egg then peels super-easily, sometimes the shell is even floating around in the water by itself leaving my egg completely peeled without me touching it again! Hey, anything that makes my time spent in the kitchen quicker is a winner in my book, no?? I will say it helps if your eggs are hard boiled and not soft boiled. You want a good, firm white to take this kind of abuse! It also helps if you’ve popped the cooked eggs in the fridge for awhile after you boil them to get them good and cold. But this always works beautifully for me. Give it a try and let me know what you think! This entry was posted in Blog Posts and tagged Cooking on June 14, 2015 by Texas Homesteader. Whoa!!! This is brilliant! Definitely sharing on my Facebook page and pinning! I’ll be trying this technique next time I make hard boiled eggs! Thanks for sharing on Simply Natural Saturdays. Hopping over from Natasha in Oz “Sundays Down Under”. This is such a great tip…my mom showed it to me recently and I was shocked how well it works. It’s almost magic. Love it! Thanks for posting. This is awesome!! Can’t wait to try it!! Thanks for sharing on my 2 Favorite Things on Thursday!! Hope to see you again tomorrow!! Pinned! What? Where has this been all my life? I’m so going to give this a try the next time I boil some eggs for the kids. I’m sure my kids will appreciate not having to help me peel a whole pot of eggs…lol. Thanks for sharing on Merry Monday. Great tip – pinning to my kitchen hacks board! 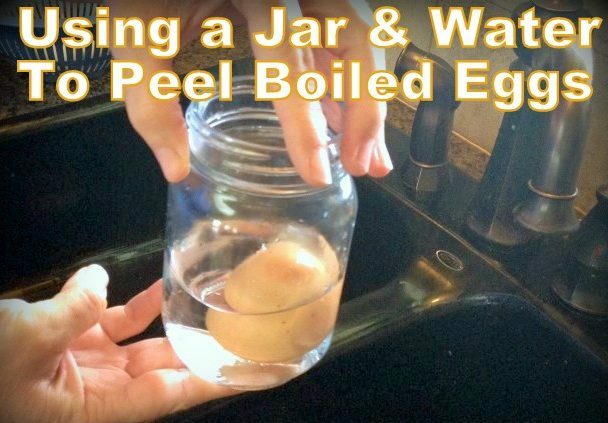 I gotta try this next time I try to peel hard boiled eggs. Great tip. I can’t wait to try it. My eggs always look pitiful when I try to peel them (lots of missing chunks that stick to the shells) and it always takes me so long. I can’t wait to try this tomorrow! And I can’t wait to share it with co-workers, we are always trying to come up with the easiest and best way to peel a boiled egg. I’ll have to try it again with HARD boiled cold eggs. It doesn’t work so well if the eggs are medium hard boiled and still hot, trust me…. I will pass this method on to others. This looks like a great way to get my little one involved. She loves to help, and I bet she’d be great at this. Are these ostrich eggs? I’ve never boiled an egg for 15 minutes in my life! Don’t they get that nasty grey-green ring around the yolk? I’m using my own eggs too, good large ones and it only takes 8 mins to cook them set in the middle. I’ll have a go with a batch of ours tonight and see how it goes. What? Thanks for the tip and the video ! This is the best idea I have heard since sliced bread, LOVE IT! Thank you! I kinda do mine about the same way as you. I start my eggs in a pan of cold water with about 1 t. vinegar and salt. Bring water to full rolling boil, turn off the heat, leaving pan on the burner (providing you have an electric stove that is ) and put a lid on the pot and leave the pan set for 10 minutes ( don’t forget to set your timer) but it all depends on your altitude, shape of the pan and the size of your eggs, as well as the ratio of water to the eggs, it can take a few minutes more. Drain the hot water and run cold water over the eggs to stop the cooking process. Drain the cold water, put on the lid, and with one hand, hold onto the lid and give your pan a good shimmy shake. After a few good hard shakes you will notice that the shells are very easy to shell, Then store your eggs in an air tight covered container at which time they should be eaten within 5 days. My late aunt had taught me this several years ago. The only difference, I shake my eggs in the pan they where boiled in and she put hers in a Tupperware container and then shook them all about. My biggest temptation is not adding a little salt when eating hard boiled eggs. I had cut back on the salt some years ago so now I hardly ever use salt.